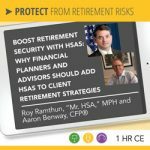 Aaron Benway, CFP®, MBA, is Co-Founder of HSA Coach. Aaron is also Founder of AB Financial which offers financial planning and investment management guidance. Aaron is passionate about health, financial wellness and achieving one’s goals in life, whatever they are. Most Americans are not saving enough for retirement. Further, we underestimate how much of our retirement income will be spent on health care costs. Health savings accounts (HSAs) can help fill a void by offering tax efficiency and flexibility to meet retirees’ changing needs as they age. Prior to founding HSA Coach, Aaron was the CFO of HelloWallet, an online financial guidance application sold to employers as part of a financial wellness program. Morningstar (NASDAQ: MORN) purchased HelloWallet in 2014. Prior to joining HelloWallet, Aaron was the head of financial planning and Analysis (FP&A) at General Motors (NYSE: GM), and before coming to GM Aaron was an investor at the Carlyle Group (NASDAQ: CG). Aaron earned a degree in electrical engineering from the US Naval Academy and an MBA from Harvard Business School. Aaron started his career as a Naval Nuclear Engineer serving aboard the Navy cruiser USS California (CGN-36), before serving as a staff intelligence officer at the Pentagon. Aaron has deployed to the Arabian Gulf as part of Operation Desert Strike, as well as to Tuzla, Bosnia as part of NATO Peacekeeping Mission Operation Joint Forge. How can you hire Aaron to speak at your event? Aaron Benway is an experienced speaker and presenter with a wealth of knowledge on retirement planning and retirement income management and is available to speak at your conference or appear at one of your events. Email betty.meredith@retirement-resource-center.net or phone 847-686-0440 x102 us directly to receive a free voucher to view a sample of Aaron’s presentations. Or fill out this simple form to let us know your interests, and we’ll get back to you shortly with speakers and availability!